March 27, 2015 – Compass Box could have come up with a simple name for its first bottling to mark the company’s 15th anniversary, but “Hedonism 15th Anniversary” isn’t quite in the company’s character. John Glaser and his team decided on “Hedonism Quindecimus,” using the Latin word for “15th” instead. The whisky is a fitting choice for the anniversary, since Hedonism was the first Compass Box release in 2000. The blended grain Scotch whisky helped set Glaser’s young company apart from other independent bottlers and started a pattern of uniquely-named whiskies that continues to this day. While Hedonism Quindecimus carries no age statement, the five different grain whiskies that make up the limited-edition blend have plenty of years in the barrel. Glaser and associate blender Gregg Glass used 28-year-old grain whisky from Dumbarton (closed in 2002) matured in ex-Bourbon casks, 20-year-old first-fill ex-Bourbon casks and 25-year-old rejuvenated hogsheads from Port Dundas (closed in 2009), 20-year-old first-fill ex-Bourbon casks from North British Distillery in Edinburgh, and a “mystery” batch of grain whisky sourced from Loch Lomond and matured in ex-Bourbon casks. According to Compass Box, the exact provenance of the Loch Lomond parcel is not known, but was blended at some point and left to mature for a total of 32 years. 5,869 bottles were produced at 46% ABV. Hedonism Quindecimus will be available at whisky specialist retailers in the UK starting April 15 and in the US as of May 1, 2015. Pricing has not been announced. 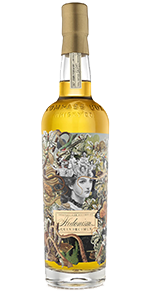 Late Friday, Compass Box unveiled the second special bottle in its anniversary series. A magnum-size version of The Peat Monster will also go on sale April 15 in the UK, with US availability beginning in June. Editor’s note: This story was updated to include details on The Peat Monster special bottling.